Createspace Independent Publishing Platform, 9781492746591, 112pp. Since the publication of the #1 best-seller Rocket Boys: A Memoir in 1998 and the premiere of the movie October Sky in 1999, many Homer Hickam readers and fans have wondered how and why he wrote the book, and how the movie was made. Incidental to that are such questions as "What is Jake Gyllenhaal/Chis Cooper/Laura Dern, etc. really like?" and "What's it like to have a movie made about your life?" and "Why are the book and movie different?" and "Why are both book and movie still so popular after all these years?" The answers to those questions and a lot more are in Homer Hickam's new Kindle Single "From Rocket Boys to October Sky." If you think you know the story of the book and the movie, you don't Hickam says "Writing Rocket Boys wasn't easy. In fact, I got a million dollars of psychotherapy I didn't even know I needed " The making of October Sky wasn't easy, either. 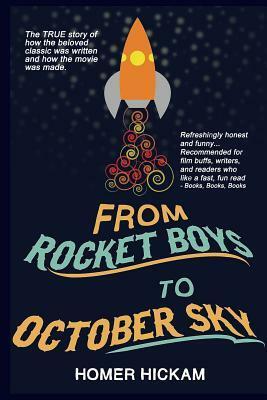 "From Rocket Boys to October Sky" gives lots of behind-the-scenes stories both on-set and off. Before the first frame of film was exposed, Hickam was involved with the writing of the screenplay and his comment when he saw the first draft -"I'm going to have to go up to West Virginia and apologize to everyone in the state "-gives an idea of how that went. Be with Homer Hickam as he struggles with the complexities of how a major Hollywood motion picture is made, and how he disagreed with aspects of the film even while he admired the dedication and professionalism of the men and women making it. Readers will also be alongside the director, producers, actors, and crew as they create one of the most beloved movies ever. The book has lots of photos taken on the various sets, too.